Hello my fem film makers! I wanted to share with you a great tip to begin to understand HOW dialogue is constructed. Like essays, there is a particular structure to script writing that you must familiarize yourself. 1.) Get to know the structure by searching google for any of your favourite movies or t.v. scripts. obstetrician--enters through the front door rifling through the mail. Hello Katarina. Make anyone cry today? Sadly, no. But it's only four-thirty. 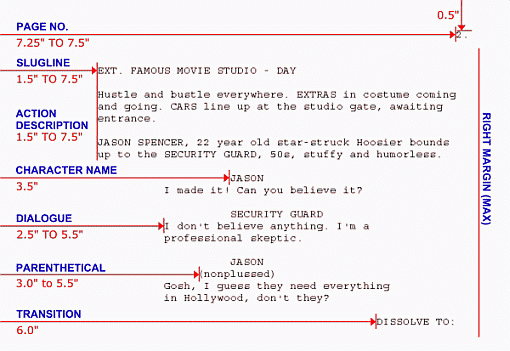 This is a great visual exercise to see the layout or format of the script, and also to study the use of dialogue. A popular television series that writes sitcom comedy extremely well is Modern Family. I’ve started looking for who is behind the camera on these kind of successful and well funded television shows to get a feel of whose direction did the script flow through. This picture should give you a clue. Yup.. It’s predominately men. There’s a lot of work to do and a lot of amazing evolving that will come naturally on and off screen from having women in positions of influence in media. But first, to become the fantastic female movers, shakers and influencers – We must know our craft! Think of a shiny office at HBO, where someone is reviewing your script, you’ve only got one shot, one page to convince them (Most editors will not read on to the next page if you don’t capture them in the first). But, even before this, you don’t even make it onto the desk if you don’t have at least an attempt at formatting- So let’s brush up. SOME BASICS : So the First thing to include is setting. Where are your characters? This can be a big decision when it comes to feasibility of a film. If you have the characters jumping all over in different locations, you know that you’ll have to actually go to a tonne of locations or build sets that match your location- which is expensive monetarily and energetically. This is where for beginner film makers especially the advice has always been- WRITE WHAT YOU KNOW. Be realistic as far as what places you have access to. Write scenes that take place at locations you have access to– .. Do you live in a Urban Setting or Rural? Do you know someone with a beautiful house that is staged wonderfully? Do you know someone with a boat? a plane? Do you have access to cultural elements- festivals- art? Do you live by an abandoned building? A breathe taking view? Okay, you get the idea. Take what you have in your life and build your story around that. For More Complicated Formatting: When writing a scene that takes place in a general location where characters move between sub-locations, you don’t have to repeat the location or the time. Use this technique if the change in location occurs inside what would be considered a “scene”. If you have a scene that takes place immediately afterward in the same location you can use “Later” in the time of day to denote the passage of time. When using a proper name of a location in your scene heading be sure to enclose it in quotes. If a scene moves from interior to exterior, a new scene heading is required. The primary reason for this is it gives the production department a clue as to how to schedule the scene. The exception is when it’s suppose to be a tracking scene that follows the characters from inside to outside. 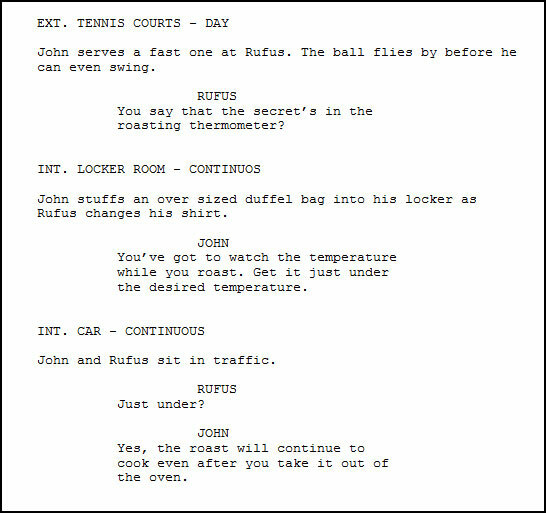 You can add additional details to the scene heading using a hyphen or [brackets] after the time of day to designate things like [TRAVELING] for a car scene or [FLASHBACK] to denote it as a flashback. Another way to indicate a FLASHBACK is to place it on it’s own slugline before the Scene Heading. “Scene Heading”, “slug-line” – you’re already in the game with that terminology! 😉 This is useful if the Flashback covers several scenes. Make sure to add an END FLASHBACK when coming out of it. . These slug lines act as special indicators and are useful for inserting special shots or for drawing out an important visuals. An example I want to bring up specifically is with regards to slug lines to indicate a text message received on a phone using the slugline “ON SCREEN” – we use the “JOHN” to come out of this screen shot.